Cork's Brian O'Driscoll faces a spell on the sidelines. THE CORK FOOTBALLERS have suffered another injury setback after Brian O’Driscoll dislocated his shoulder in training on Tuesday night. 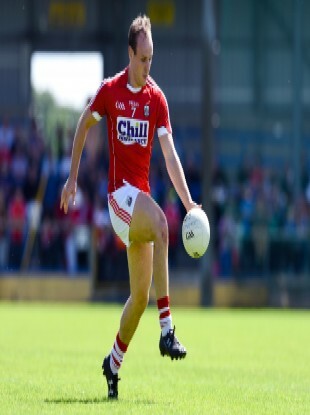 The news was first reported by the Southern Star with the 22-year-old now set for a spell on the sidelines as Cork prepare for their two remaining league games in their battle to avoid relegation to Division 3. The42 understands that O’Driscoll’s injury is being assessed and he will miss a minimum of four weeks, with an exact time frame set to be known at the end of this week. The loss of O’Driscoll comes on the back of forward Brian Hurley being ruled out again for another year after rupturing his hamstring. Cork are away to Derry on Sunday before they conclude their league campaign at home to Down on Sunday 2 April. O’Driscoll has been a regular fixture in the Cork team since he made his league and championship debut in 2014. The Tadhg MacCarthaigh club man won three EirGrid Munster U21 football medals in a row between 2012 and 2014, before captaining the side that lost out narrowly to Tipperary in the 2015 Munster final. Email “Another injury setback for Cork as O'Driscoll sidelined after dislocating shoulder”. Feedback on “Another injury setback for Cork as O'Driscoll sidelined after dislocating shoulder”.